Jamie Donaldson said the 2014 Ryder Cup was the greatest experience of his golfing career after clinching the trophy for Europe at Gleneagles. 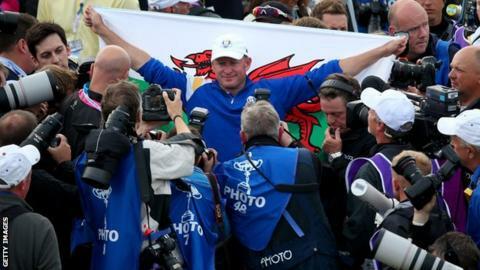 The Welshman, making his debut at 38, beat US opponent Keegan Bradley 4&3 to give Europe the 14½ points needed. Donaldson sealed the win on the 15th green with a majestic second shot that stopped three feet from the cup, with Bradley conceding defeat. "This is pretty damn special. It's hard to put it into words," Donaldson said. "There's nothing quite like the Ryder Cup. I've played all over the world and quite a few majors and this is the pinnacle of it all." Captain Paul McGinley's side led 10-6 going into the final day and Europe needed four points to retain the trophy they won after coming back from the same score two years ago. But it was mostly American red on the leaderboard after the early holes and the hosts had to weather that early storm. World number one Rory McIlroy led the way, stamping his authority over Rickie Fowler from the start to win 5&4. Graeme McDowell had been three down after nine holes against rookie Jordan Spieth but fought back to win 2&1, while Martin Kaymer beat Bubba Watson 4&2 and Justin Rose battled to a half against Hunter Mahan. But with Patrick Reed, Phil Mickelson and Matt Kuchar winning for the United States the pressure was still on to get over the line. The matches between Sergio Garcia and Jim Furyk, and Ian Poulter against Webb Simpson hung in the balance with never more than one hole between the players. But the safety net for Europe was provided by Donaldson, teeing off 10th and steadily building an advantage he would never relinquish. Bradley battled at the 14th to prevent Donaldson clinching it, but the Welshman was not to be denied at the next hole as he found the middle of the fairway off the tee before switching to his irons to land the ball almost on to the pin. "That was a perfect yardage, all I had to do was make a good contact and start it on the right line," Donaldson said. "I knew the crowd were gathering and things were coming down to my game and obviously I was just trying to win my point. It was vital I kept plugging away. "I was just trying to not spend too much time looking at the scoreboard and just concentrate on my match and that's what I did, and was able to do it well enough to close it out." The singles victory capped an impressive debut for Donaldson, who partnered Lee Westwood in Friday's foursomes to a two-hole victory over Jim Furyk and Matt Kuchar. The European duo were again paired together on Saturday, losing the morning fourballs 4&3 to Furyk and Hunter Mahan but bouncing back with a 2&1 victory over Zach Johnson and Kuchar in the afternoon foursomes. Donaldson paid tribute to Europe captain McGinley after the 16½-11½ victory, adding: "I played under Paul McGinley at the Seve Trophy and I knew he would be sensational here. He's been an inspirational captain."